You remember the best jacket you owned that kept you from freezing on that trek? The sleeping bag that allowed you to wake up with your toes intact? The chances are both of them had goose down filling. This exquisite material is responsible for bringing you the most welcoming warmth in a number of scenarios. Since it’s the most sought after filling, we decided to pick the 10 best goose down comforters for you. You can rest assured of the quality of insulation so it’s like picking crème de la crème. We have chosen comforters over a large price range suited for different types of sleepers. We have already written a complete guide about best down comforters for the money. How do we know which goose down comforters are warmer? Which are the best goose down comforters? White vs. Grey: No, white goose down is not in any sense better than grey goose down. The warmth or quality of goose down does not depend on its color. Don’t be fooled by the bold captions claiming White goose down filling. It’s just marketing hype. Insulation: Duck and Goose down are equally good at insulating. They can manage the same amount of warmth as well. The difference lies in the size of goose clusters which are larger than duck clusters. We are talking about the size of the plumules which provide the down comforters their fluffiness and warmth. Because of the larger size, the fill power of goose down is nominally greater. Also it is tad more resilient than duck down when it comes to maintaining its loft. Odor: The other main difference between goose and duck down is the smell of the down. Geese only eat grass while duck has a more varied diet. So duck down has a stronger odor than goose down. If processed properly, the odor should not reach you. But sometimes it compounds when the product has been kept in packaging for long periods. Contrary to popular notions the quality of goose down does not depend on the climate where the geese are bred. It has to do with the maturity of geese from whose bodies the feathers are harvested. More mature geese yield larger, fluffier plumes. Hungarian goose down: This is considered premium goose down. Hungarians have a tradition of raising geese and allowing them to mature at natural rate before plucking the down. Their plumes are plush and retain warmth well. Poland goose down: Like Hungary, Polish breeders also raise geese to maturity. As a result, their goose down is of premium quality. Chinese goose down: The monopoly in the goose down comforter market is of Chinese goose down. This is harvested from young geese whose feathers haven’t developed to the large plush plumes. As a result the quality is inferior to European goose down. Pyrenees down: This is an exotic quality of goose down found in the Pyrenees mountain range between France and Spain. It is famous for its superior warmth and durability. Others: High quality goose down also comes from Canada, Greenland and Romania. Siberian goose down: The myth that cold climates encourage the growth of better down must have given rise to the Siberian goose down myth. Although many brands claim this fill, geese can’t survive in Siberian weather. There are no commercial breeding points of geese in Siberia. It’s a marketing ploy and there’s no confirmation on where this down originates from. It could be your good ol’ Chinese goose down being sold under a fancy name. Fill Power: This gives you a measure of the insulating capability of down. The higher the fill power, the more air it can trap and hence, the better it will insulate you from the outer temperature. Higher fill power also means that the down is stronger and more durable. Fill amount: Check out the total fill weight that has been stuffed into the down comforter. The latter will be heavier. Those who want the fluffy feeling but average warmth can go for the second option. Those who want lightweight down comforters and the same warmth can go for the former. Also look at the construction. Baffle box construction spreads warmth more evenly than sewn-trough/box type construction. It also efficiently keeps the down from piling and helps maintain the loft. Warmth: Goose down comforters are marketed as premium. They should correspond to the expectations of warmth from them. We picked out those comforters that have high fill power. As for the fill weights, we made a varied choice. Some are heavy-duty comforters for winter use and others are all-season comforters. Comfort: We checked how the best goose down comforters felt for regular use. Are they fluffy enough? Does their filling weigh them down so much that they are difficult to tug at? Is the warmth distributed uniformly across your body? Does their shell make too much crinkling noise when it moves? Shell: The material that the down is stuffed in makes direct contact with your face. We checked that this had a thread count higher than 180 and some pleasing design to go with it. We also checked that it is down-proof and doesn’t stain easily. Maintenance: Premium goose down comforters are often costly or difficult to clean and demand a professional launderer or dry cleaner. We tried to include many goose down comforters that can be safely washed in the machine and dried in the dryer. Comforters with duvet cover anchors also got extra points. 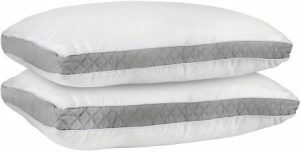 Price: We looked for the best goose down comforters in various price ranges. There are some affordable ones contrary to popular belief. We compared comforters from various price ranges based on their value for money. Egyptian Bedding Luxurious goose down comforter has claimed the top spot many of our list. It uses quality down with high fill power and fill weight. It has a variety of high thread count shells to choose from. The choice of standard sizes and easy maintenance make our lives easier. But the thing really seals the deal is the highly affordable price tag. Couple that with long-term customer satisfaction and you know the deal is legit. Wild horses couldn’t have kept it from being on our best goose down comforters list. 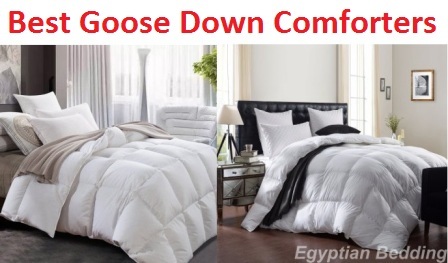 The Egyptian Bedding Luxurious goose down comforter uses 100% goose down in its filling. This has 50 ounces of 750+ fill power down in the King size so you can imagine the warmth per unit of weight. The Twin size runs 68” x 90”. The Queen size is 90” x 90” and the King size is 106” x 90”. It uses baffle channel construction. This means there are 6-sided baffle box partitions to hold the down but with a hole in the corner to insert down. Internally the hole has not been closed. The down does not shift between the baffles in the long term, so it is as good as baffle box construction. This goose down comforter has a 1200 thread count shell. It is made of Long Staple Gaza cotton which, more popularly goes by Egyptian cotton. This higher-than-average TC prevents the down from popping out. So folks with down allergy can probably give this one a try. The same comforter is also available in 800 and 600TC shells. There’s some rustling noise when the comforter is new. It’s because of the crispiness of the cotton. It goes away after a few weeks and is not bothersome to begin with. There are loops along the edges of the shell to attach duvet cover. 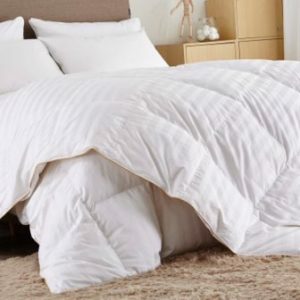 We recommend using a cover- The manufacturer marks this goose down comforter as dry-clean only. But users have successfully loaded it in front loading machines and run it in the delicate cycle. Make sure to use low temperature. There might be a small odor upon arrival which dissipates with some airing. The Egyptian Bedding Luxurious goose down comforter is an excellent deal on paper. It didn’t disappoint us in person either. This is warm comforter meant for moderate climate to cold winters. We would suggest this for a cold sleeper only if you intend to use this in summer. It is highly breathable though and much more lightweight than other heavy-duty comforters. It is fluffier than we expected of the price. Initially it felt a little flat but it inflated to it full potential within a few days. It has the plush feel that we expect from expensive goose down comforters. And it is easy to tug around especially for someone who cannot pull a lot of weight. The Snowman White goose down comforter is one of those plush and warm comforters that keep your tootsies from falling off in winters. This is a heavy-comforter with high fill power down. Unlike many other choices in the list, it’s available in other colors. The ability to wash it and put a duvet cover on it made it a prime candidate in our eyes. The hypo-allergenic construction ensures that everyone can use it. It checks all the boxes to make one of the best goose down comforters in the market. The Snowman white goose down comforter uses 100% of high quality Chinese goose down. We know we mentioned that Chinese goose down is of moderate quality but this one flaunts a fill power of 750-800. The down has been harvested from a non-epizootic area so it’s completely safe and healthy. This has a baffle box construction but a gap is left in the corners of the baffle to fill down. That being said down does not shift between the boxes and the comforter maintains the loft. This goose down comforter is available in Twin size at 68” x 90” with 45 ounce filling. The Queen size is 90” x 90” with 55-ounce filling and the King size is 106” x 90” at 65-ounce filling. The shell is 100% cotton. It is also down-proof so it doesn’t let the down escape. It’s anti-dust mite and hypoallergenic. There’s a contrast piping along the edges of the shell which also reinforces these area. Duvet cover loops have been stitched on to the edges to keep the comforter from pining inside the covers. The manufacturer recommends dry-cleaning this goose down comforter. You can put it in the machine in a cold, low-temp cycle and allow it to tumble-dry at some personal risk. It is also available in a delicious Ivory color model which would look fabulous in a warm décor. The Snowman white goose down comforter is for the long winter that Ned Stark warned about. The high fill power and fill weights keep you warm. But it’s surprisingly breathable. Even warm sleepers will not complain that it’s sultry unless you are using it in Florida in the middle of a summer. When it arrives, it looks flattened. Within a couple of days and with a few shakes it springs up to its full fluffy size. It is the plush dream that you expect to see in high-end hotels. It might have a faint odor from tight packaging which escapes when you air it in the shade for a while. It bangs big for the bucks based on the list price. 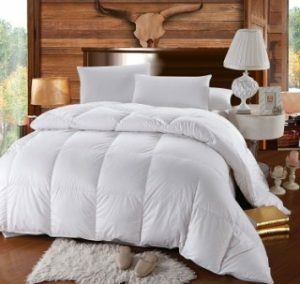 Eddie Bauer white goose down comforter is your lightweight friend for summer moderate winters and everything in between. This helps hot sleepers realize that they also deserve high quality comforters. The warmth is maintained with high fill power. The fill weight is kept in check here. The fact that it’s machine-washable only adds to its street cred. The striped design goes well with the cool interiors of a hot sleeper. This one literally swaggered down to our best goose down comforters list. The Eddie Bauer white goose down comforter goes for 100% goose down. This is a 700 fill-power variety of down so it provides excellent warmth. There are two sizes in this. The Queen size measures 90” x 98” and carries 25 ounces of the fill. The King size measures 108” x 98” and carries 30 ounces of fill. We were totally psyched at the extra 8 inches length the Queen sizes and extra 2” in length, 8” in width in the King size. The filling is divided inside into 6-sided baffle boxes. The perpendicular pieces of cloth used in between two layers of shell help the warmth to spread evenly, even at the borders of the boxes. On the contrary sewn-through construction leaves the edges of the boxes vulnerable to cold. The shell of this goose down comforter is made of high-quality Damask cotton with a striped design. The edges are stitched double-needle. This keeps them firmly sealed and prevents any down popping. The manufacturer has labeled the comforter as machine-washable and machine dryable. We can’t appreciate the convenience of this enough. But err on the side of caution by using only low temperature to wash and dry. Putting tennis or wool balls while washing/drying will simultaneously fluff up the comforter and prevent clumping. Everything that warms is not gold. Eddie Bauer goose down comforter shoulders the burden of expectation from the much overlooked class of hot sleepers. Based on the fill weights and the sizes, you can tell that the filling is spread thin. So this is a lightweight comforter and has average fluff. It breathes very well so you don’t wake up in a sweat pool of your own making. There is no shedding from it in the long term. It is ‘just right’ for summers and light winters. Folks from subtropical areas can use it year-round. It fluffs up within a few days of arrival. We didn’t find any residual odor from it. Downlite also claims that the down has been plucked exclusively from poultry birds and it did not involve any animal cruelty. That should help you sleep better. The Topsleepy Luxurious goose down comforter is built to satisfy a large range of customers. Its middle-of-the-road statistics allows it to be used throughout the year. It best selling point is its quality at an amazing price. The choice of sizes means nobody is left out from enjoying its warmth. It is health to use for the entire family with it hypoallergenic status. It is also quite easy to maintain. This is the most budget-oriented product in the best goose down comforters list. The Topsleepy Luxurious goose down comforter combines fluffy and moderate warmth in one piece. It uses 50% down and 50% feathers to create a plush comforter. At 500+ fill power it does not get too hot for the warm sleepers. The King sizes run 102” x 90” and carries 45 ounces of filling. The Queen size runs 88” x 88”, the twin size is 68” x 88” and the Cal King size is 106” x 90”. It uses the tried and tested baffle box construction. These don’t give down a free pass to other boxes and keep the warmth distributed evenly. It also avoids cold spots along the stitching. This goose down comforter is draped in a cotton shell of 300 thread count. This is breathable enough and allows proper ventilation throughout the night. It is hypoallergenic. There are fabric ties along the edges of the shell that allow you to secure the duvet cover. This keeps the comforter in proper position inside the cover and prevents bunching up. The manufacturer says spot-clean is the best method to keep this goose down comforter clean. But it’s also machine-washable under low temperature. There is a very slight odor when it first arrives. Within a few hours it loses the odor. It might not feel so fluffy the first time either. But it inflates to its full potential within a few days. The Topsleepy Luxurious goose down comforter brings all-seasons comfort. It is fluffier than average and wraps you in softness once it inflates completely. But it shows medium warmth so you can use it through the year. It’s still more inclined towards a cold sleeper. Warm sleepers might want something lighter for the summers. This is quite durable too. It maintains its loft if washed according to the instructions. A small caveat though. It does take some time to recover from its tight packaging to its perky self. With 50% feather, do not expect cloud-like fluffiness. Just because you want warmth doesn’t mean you should compromise on looks. The Puredown white goose down comforter is a stylish creation meant to keep you warm haute couture. This all-season comforter uses high fill power down combined with average fill amount for continuous use around the year. It has a high thread count cotton cover and a durable construction. It’s practically ready to the boot to be on your best goose down comforters list. The Puredown white goose down comforter is an exercise in 75% goose down mixed with feathers. The 600 fill power down provides the cozy warmth that we desire through the seasons. Its Twin size is 68” x 90” and filled with 28 ounces of down. The Queen size is 90” x 90” with 37 ounces of down. The King size is 106”x 90” with 44 ounces down. It uses box stitching i.e. sewn-trough structure to hold the down in place. The down does not shift easily between various squares. This goose down comforter has a pure cotton shell. It has a 500TC thread count which prevents down leakage. It sides are curled in satin piping in golden color. Not only does it complement the striped on the shell, it also keeps down from leaking off the sides. The shell is hypoallergenic. There are duvet cover tabs along the edges which secure the cover on to the comforter. Puredown recommends only dry-washing its goose down comforter. The comforter arrives very flat and it has to be fluffed into it proper loft. The best course it to toss it into the dryer and run it one cycle on low temp. It may also have some residual odor from packing. This goes away with a few hours of airing. The Puredown white goose down comforter is for all-seasons use. If you are looking for a lightweight, sleek comforter this is for you. You won’t lose yourself in its fluff, Puredown simply doesn’t roll like that. A hot or warm sleeper might enjoy the moderate warmth of this comforter. It also ventilates well in the hot climate. It is much warmer than it looks though. So you can it from summer right down to moderate winters. Because of its sleek construction, it’s easy to fold and store. It also responds well to your night-time tugs. Royal Bedding goose down comforter may use misleading goose but they are as royal as it gets. This fluffy comforter will satisfy your need for exaggerated softness unlike the Puredown comforter. This is a high fill power comforter to help you survive the winters and cool seasons. Its reassuring plushness is almost hotel grade. Its top-notch construction locks it place in the best goose down comforters list. The Royal Bedding goose down comforter uses 75% hand-harvested goose down and 25% small down feather. It has the right balance of weight and fluffiness. It is available in 3 sizes all stuffed with high fill power down. The Twin size runs 68” x 90” with 40 ounces of 650+ fill power down. The Queen size runs 90” x 90” with 50 ounces of 750+ fill power down. The King size is 106” x 90” with 60 ounces of 750+ fill power down. It uses the baffle box design of filling down. So the down is confined securely in 6-sided boxes. This keeps it from shifting between boxes and piling into one side. This goose down comforter is draped in a 500 thread count cotton shell. This is a hypoallergenic cover. The edges are gusseted further strengthening its baffle-ox construction and maximizing warmth. There are duvet anchor tabs to connect the duvet cover. This keeps the comforter from shifting inside the cover. The manufacturer has deemed this comforter dry-clean only. Given its size, we suggest you put a duvet cover on it and wash it instead. Keep fluffing the comforter to retain its loft and dry-clean only occasionally. You can fluff it in the dryer though when it first arrives. The Royal Bedding goose down comforter is lightweight in proportion to the warmth it provides. A cold sleeper can probably use it in subtropical climates. But it’s warm enough for the brutal winters with its high fill power and high fill amount. 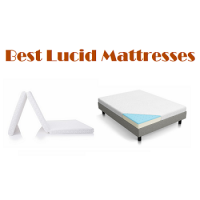 It is easy to handle on the bed in spite of its insulating capability. This is a very fluffy bedding which never fails to satisfy any customer in terms of loft once it fully inflates. The Royal Hotel Dobby Checkered goose down comforter is a true Goldilocks comforters for all-seasons use. It walks the spot-on balance between weight, warmth and fluffiness. The checkered design is cherry on the cake for those of us who are tired of seeing bland comforter designs. This hypoallergenic comforter rightfully earns its place in the best goose down comforters list. The Royal Hotel dobby checkered white goose down comforter gets warms on 90% goose down and 10% feathers. This is 650 fill power down which is bang in the middle of our good-excellent warmth zone. The Queen size of this comforter runs 90” x 90”. The King size is 106” x 90” with 40 ounces of filling. It uses box-stitching construction. This is perfect for air-circulation in an all-seasons comforter. 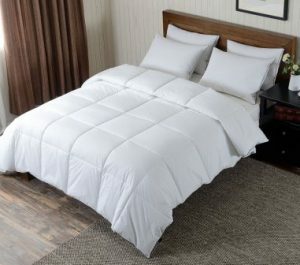 This goose down comforter has a 300 thread count pure cotton shell. This is hypoallergenic. It has duvet cover anchors on the edges which help you tie down the duvet cover so that he comforter doesn’t pile up inside. The piping at the edges of the shell prevents down popping from here. The checkered design is a lovely addition to the décor of your room. It is machine-washable at low temperature. Use the old wool ball/tennis ball trick to fluff it up. The manufacturer recommends dry clean though. The Royal Hotel dobby checkered goose down comforter has optimum fluff so that it feels soft but not too heavy. The fill is warm enough to work through all seasons of Florida. Based on whether, you are a warm or cold sleeper you can use it with a sheet inside as additional layer on really cold days. It is much warmer than it looks though. This is a durable comforter. We have heard no complains of down popping. Once rush in the dryer and it springs right back to original fluff. There are all-season comforters and then there are summer-spring comforters for the cold sleepers. The Sanxiang goose down comforter lies in the second category. This is a lightweight, lightly filled comforter with high fill-power. Even the moderate temperature deserves the best down treatment so here we are. This is a necessary addition to our best goose down comforters list. The Sanxiang lightweight goose down comforter uses 100% authentic goose down. There’s no feather to adulterate the smooth insulation. This is 750+ fill power down so it has excellent warming capability. The Twin size is 68” x 90” with 15.2 ounces of down. The Queen size is 90” x 90” with 20 ounces down. The King size is 106” x 90” with 24 ounces of down. The bonus Cal King size is 108” x 94” with 25.4 ounces of down. This has baffle box construction meant to spread the warmth equally in all parts without any cold spots. This goose down comforter has a 500 thread count cotton shell. Upon receiving increasing demand from the customers, Sanxiang acted on the feedback and added duvet cover anchors. They recommend cleaning by washing with cold water and tumble dry. It can ideally be dry-cleaned as well. The manufacture assures that the down came from non-live plucked geese. The Sanxiang lightweight goose down comforter fluffed up to full potential within 3-4 hours. This is very fluffy lightweight comforter. It’s perfect for summers and springs and even colder weather in subtropical regions. Many users have reported that it’s just the right weight and warm for use in these weathers. This is a high quality product too. It’s very durable and requires minimal fluffing to work as good as new. The Basic Beyond goose down comforter is an all-seasons bedding. It uses high fill power down in moderate amount for high quality insulation for all seasons. And it is a trendy piece for your bed with its design and colored piping. It’s comfortingly fluffy and constructed with the best method. For year-round use, this is one of the best goose down comforters. The Basic Beyond all-seasons goose down comforter uses 100% goose down. The sizes are generous. The Queen size measures 88” x 98” and carries 32 ounces of 650 fill power down. Same down is present in a 106” x 98” King size at 38 ounces. The Twin size measures 68” x 88” with 24 ounces of 650 fill power down. The down is sealed by true baffle box construction. This restricts down into individual squares without creating any cold spots. This goose down comforter is sheathed in a 233 thread count cotton shell. This has Greek Key print with blue satin piping. It looks pretty neat in a stylish décor. There are four duvet anchor tabs to tie down the duvet covers correctly. The shell is hypoallergenic and dust mite-resistant. This is machine-washable although the product tag recommends dry-clean. It has been successfully washed in the machine at a low temperature. The Basic Beyond all-seasons goose down comforter required a cycle in the dryer with no heat to inflate completely. It get fluffy enough to indicate its fill weight. It is comfortable to drape in cools summer nights to mid winter. It’s not for very hot summers though or for hot sleepers in moderate summer. The high fill power ensures it’s warmth. It is very light and easy to move around the bed. We were surprised by the talented spec and the highly affordable price tag of the Royalay Luxurious all-seasons comforter. But the product seems to be holding up well. This is high fill-power medium warmth comforter for all-year use. Premium down, premium shell, a suave look, this one has everything to be on the best goose down comforters list. The Royalay Luxurious all-seasons goose down comforter carries 600 fill-power goose down. The King size measures 106”x 90” and carries 37 ounces down. The Queen size is 90” x 90” with 31 ounces of down. It has the sewn-through construction which packs the down in little squares and allows the comforter to breathe through the stitches. This goose down comforter has a 600 thread count cotton shell. This is hypoallergenic and anti-bacterial. The edges are closed in simple white piping. There are corner tabs on the shell to hold down a duvet cover. This is a dry-clean only kind of comforter so we suggest putting it in a duvet cover. You can machine-wash it with a mild detergent on the delicate cycle. Use low temperature. If you use a duvet cover, you only need to wash it once a year. The Royalay Luxurious all-season lightweight goose down comforter is ‘royalay’ fluffy for a medium-warmth bedding. It is quite warm and can survive the moderate winters. But it’s breathable enough for the summer months. We were expecting some down shedding or awkward feel on our skin for the price. But there’s no compromise here. Maybe it’s an introductory offer. If so, grab it before it ends!